The above copper farthing token measures15.7 mm and weighs 1.17 grams. It was issued in the name of James Reddall, a tradesman operating from the sign of the plough in Bedlam, Bishopsgate Without, London. Obverse: (star) IAMES. REDDALL. AT , around the depiction of a swing plough facing left. Based on the style of this token it probably dates to the period 1650 to 1660. The issuing location of this token was the district of Bedlam in the Bishopsgate Ward of the city. Bedlam was a colloquial name given to Bethlem, a 13th century priory church founded by the Italian bishop-elect of Bethlehem to raise alms and funds to support the crusades to the Holy Land. 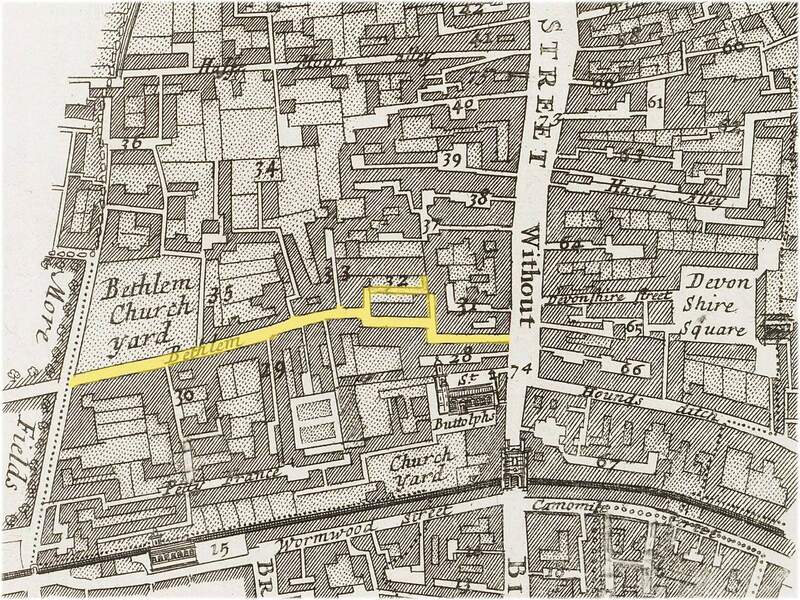 It was located just north of St. Botolphs Parish Church off Bishopsgate Street outside the city walls. By 1330 Bedlam was more often referred to as a hospital which in medieval terms may have simply denoted a hostel for travelling alms-seekers. By the 1370s the hospital had been seized by the crown and was becoming a far more secularized institution. It was from this period that it became first associated with the care of the mentally ill. So was to begin a centuries long tradition for which the institute and its later nearby successor was to became famous throughout Europe. Given the increasing demand for admission and the inadequate and dilapidated state of the building it was decided to rebuild the hospital on a site at nearby Moorfields, which was just north of the city walls and one of the largest open spaces in London. The architect chosen for the new hospital, which was built rapidly and at great expense between 1675 and 1676, was the famous natural philosopher and City Surveyor Robert Hooke. 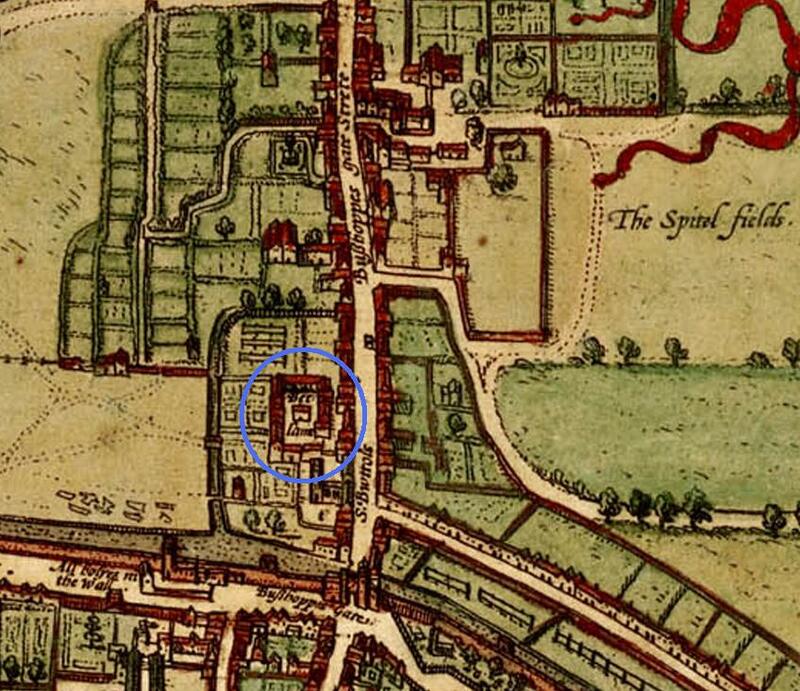 By the late 1670s the original site and any remaining buildings which had once comprised part of the original Bethlem Hospital had been absorbed by the wide spread urban development to the west of Bishopsgate Street Without. Today nothing remains of the medieval hospital. Its former site is now occupied by the Great Eastern Hotel next to Liverpool Street Railway Station. The reverse of the token bears a triad of issuers’ initials, i.e. those of James Reddall and his wife. The appearance of “I” for “J” for “James” can be explained by the use of Latin script in which Js are represented by Is. At the time the token was issued we can assume that James wife’s Christian name was Sarah, Susan or similar. 1) James Reddall – married Judith Finch on 26th September 1661 (extracted from the parish registers of Holy Trinity Church, Minories, London). 2) James Reddall – buried on 22nd February 1684/5 at St. Botolphs, Bishopsgate Without. A further reference to a James Reddall can be found in the Hearth Tax returns of 1662 for the first western precinct of the Bishopsgate Ward. He is recorded as occupying a property with 6 hearths. Based on the information on his token James Reddall’s occupation can’t be certain but it is clear that he traded from or near to the sign of the plough in Bedlam. In London the sign of the plough was adopted from the 16th century onwards by several taverns but was by no means exclusive to that trade. The above copper farthing token measures 15.5 mm and weighs 1.02 grams. It was issued by a brewer operating from premises at or by the sign of the Half Moon in Half Moon Alley which lay off the south-west side of Bishopsgate Street in the Bishopsgate Without Ward of the City of London. Obverse: (mullet) THE.HALFE.MOONE.BREW, around twisted wire inner circle, within is a depiction of a crescent half-moon on its side. There is nothing on the token to indicate the date of its issue. However, it is likely that it dates from the approximate period 1650 to 1660. Half Moon Alley, very ordinary, and ill inhabited; almost at the entrance it divdes itself, one part falling into Half Moon Court which is a good large place; and the other part in a straight Line runs Westwards into Moorfields: On the South side of this place is Stone Cutters Yard, a pretty open, but ordinary place; and on the North side is a small Alley that leads unto Dunning’s Alley. The first mention of the sign of the Half Moon in this location occurs in 1543 in a land release in which we learn that Robert Wood dwelt at “le Signe de le hulfe Mone”(1). From Strype’s Survey we learn a little more of Robert Wood and his family as the Strype records a monument to Robert’s widow, Joan, inside the Church of St. Botolph Without, Bishopsgate. Here under lyeth the Body of Joane Wood, Wife of Robert Wood, Citizen and Brewer of London, who had Issue, two Sons and three Daughters; viz. John, Richard, Joane, Anne and Frances. She deceased the 25 day of November, An. Dom. 1600. Based on the above it is implied that Robert Wood was operating a Brew House at the sign of the Half Moon off Bishopsgate Street Without as early as 1543. 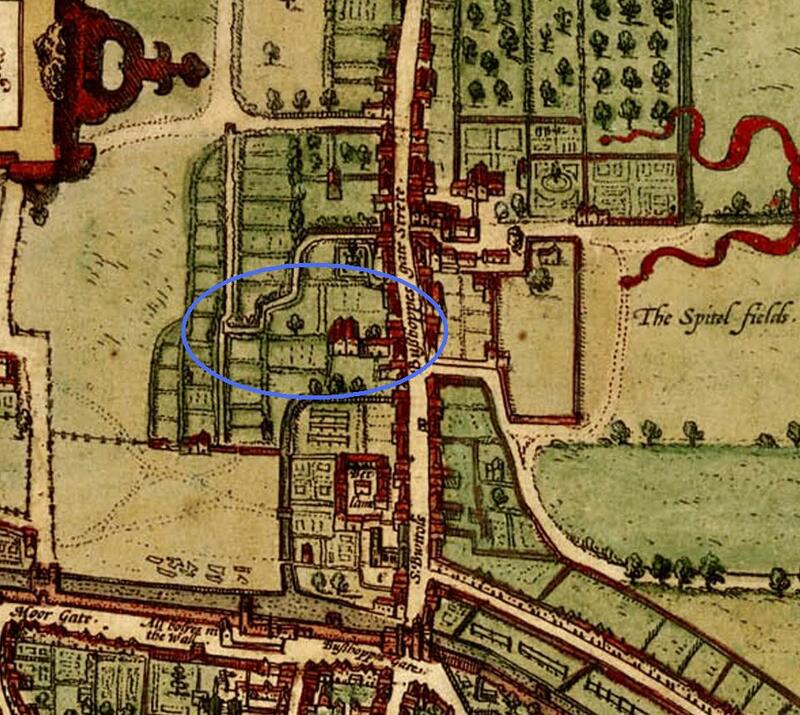 Detail from a map of Elizabethan London (1572), taken from “Civitates orbis terrarum” showing Bishopsgate Street Without and the mansions and gardens along it. 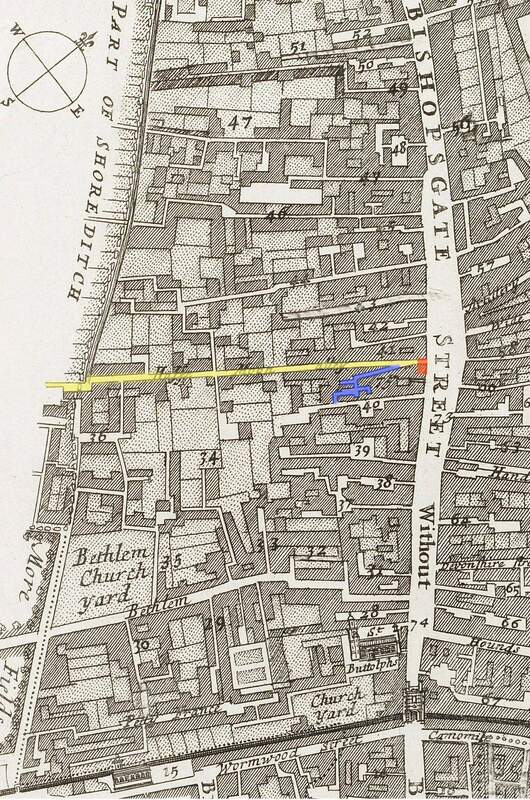 The area indicated in blue is that of the Half Moon Brew House and Alley. It further appears from Joan Wood’s Will, 1600, that she sold the Half Moon brew house with it yards, gardens, etc., to Ralph Pindar in 1597 on condition that he should pay a yearly sum of £20 to the parson and church-wardens of St. Botolph, and that in default of such payment the premises were to go to them. Joan also bequeathed various benevolent charities of the church of St. Botolph, its parishioners and poor. In the latter few years of the 16th century Sir Paul Pindar (c.1565-1650), a wealthy merchant and later diplomat, acquired much land on the north-east side of the city walls. This included the earlier holdings of Joan Wood which lay on the west side of Bishopsgate Street and included Half Moon Alley. 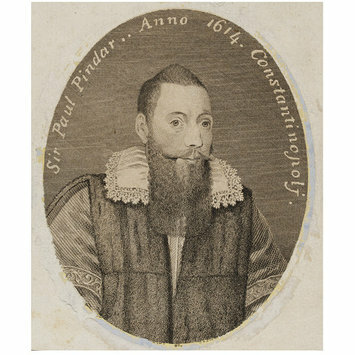 In 1623 Pindar returned to live in his London home after serving as King James I’s ambassador to the Ottoman Empire in Constantinople. Pindar’s business activities enabled him to invest in speculative trading expeditions, loan large sums to Charles I and contribute the enormous sum of £10,000 towards the rebuilding of the original (i.e. Old) St Paul’s Cathedral. However, the political upheavals of the 1640s and Charles’s inability to repay loans left Pindar with huge debts when he died. Engraved portrait of Sir Paul Pindar, by Thomas Trotter after an anonymous painting of 1614, England, 1794. In 1599 Pindar built himself a new three and a half storey timber-framed mansion on the west side of Bishopsgate Street Without at the head of Half Moon Alley. Bishopsgate Street was one of the main roads from the city to East Anglia and had recently been paved. It was also convenient for Pindar’s business activities. Less than a mile away was St Paul’s Cathedral, a rendezvous for city merchants, and Cheapside, where traders also acted as bankers. Closer still was the recently founded Royal Exchange at Cornhill, where Pindar would have met other wholesale merchants and swapped news. By 1610 the house was being used to accommodate a succession of overseas ambassadors to the Court of King James. Pindar’s magnificent town house survived the Great Fire of London (1666) and by 1660 had already been split into separate apartments. The upper storeys of the house were taken over by the London workhouse and contained wards for “poor children and vagabonds, beggars, pilferers, lewd, idle, and disorderly persons”. The ground floor rooms which led onto the street front were used as a tavern which traded under the name a sign of Sir Paul Pindar’s Head. The “Paul Pindar’s Head Tavern” in Bishopsgate Street, London, c.1890. Note the signed entrance to Half Moon Street (i.e. originally Half Moon Alley) on the right hand side of the house front. 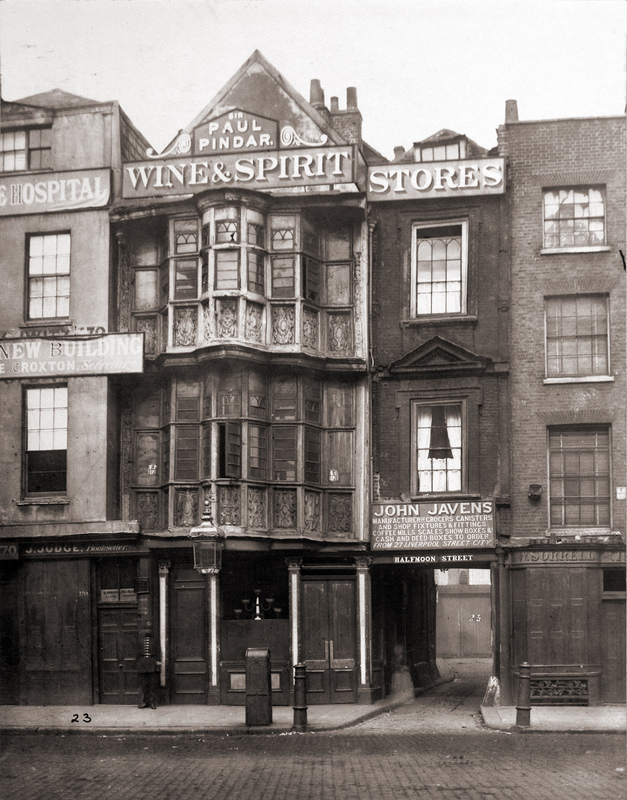 Pindar’s house, together with adjacent parts of Half Moon Alley, were ultimately consumed by the expansion of Liverpool Street Railway Station in 1890. 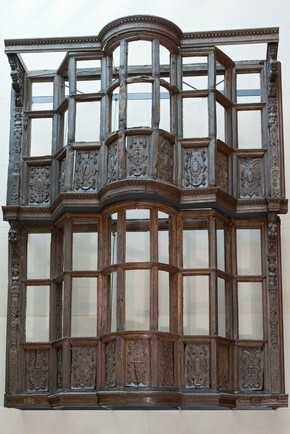 However, as an early example of its type the original timber framed façade of his house was preserved and is now on public display in the Victoria and Albert Museum. It is possible that prior to 1650 the brewer who issued the above farthing token paid rent on his brew house to Sir Paul Pindar’s estate. After Pindar’s death it is not clear who owned the brew house or the other properties in Half Moon Alley. Griffith Owen – Paid tax on a premises with 5 hearths in the first precinct on the west of the alley. A search of the parish registers for St. Botolphs Without, Bishopsgate has identified the marriage of one Griffith Owen to a Jane Spencer on the 16th May 1641. The initials of this couple exactly match those of the triad on the reverse of the token. When reviewed together with the 1662 hearth tax return this combined information would suggest that we may have found the identities of the token issuers. While the identity of the token issuers may still pose a possible question mark their stock trade is very clearly identified on the token. They were commercial brewers operating from their own Brew House, which can be thought of as more of a local microbrewery by today’s standards. In the mid-17th century ale/beer was still the traditional staple drink of the masses in Britain. Before the Victorian improvements in public sanitation, cholera and other water-transmitted diseases were a significant cause of death in Britain. Because alcohol is toxic to most water-borne bacteria, and because the process of brewing any beer from malt involves boiling the water, which also kills them, drinking beer instead of water was a far safer option. It was not uncommon for workers who engaged in heavy physical labour to drink more than 10 pints of dilute or “small” beer during a day to maintain their hydration level. Small beer is that liquor extracted from the “second runnings” taken from a very strong beer mash. It typically is of low alcohol content. Small beer also formed the stable liquid consumption of the rest of Britain’s household, both young and old alike. With such high consumption levels it was not always practical or feasible for every household to brew their own supply, particularly in the often cramped and overcrowded towns and cities. This is where the local brew houses filled the gap in the market. Taverns, Inns and Ordinaries also help fill the gap but then, like today, they served more as a place for social drinking and dining. Beer had been the traditional drink in England for centuries, but by the second half of the 17th century it was starting to face competition for the first time. Gin, for one, was new on the London scene, but it was just one of a host of new beverages cutting into the national consumption of beer. These included tea, coffee, hot chocolate and brandy. The problem for English ales began in the 1640s when both Parliament and the Royalists created excise duties on beer to pay for the Civil War. Parliament created the first of these in 1643. After the Restoration beer duties became more important than ever, because they became a replacement for the old baronial duties that had previously funded the army. At the same time, the government was encouraging the distilling of gin as a cheap alternative to beer. To facilitate this both Charles II and James II licensed brewers to distil spirits on their premises. In these circumstances the decline of beer consumption was inevitable, although the situation only hit public awareness around 1690. In the 18th century gin drinking became a huge public problem in London, particularly within the poorer and lower classes. Gin Palaces became common place in parts of the city and were often seedy dens on iniquity where the clientele could famously get “drunk for a penny. Dead drunk for twopence”. 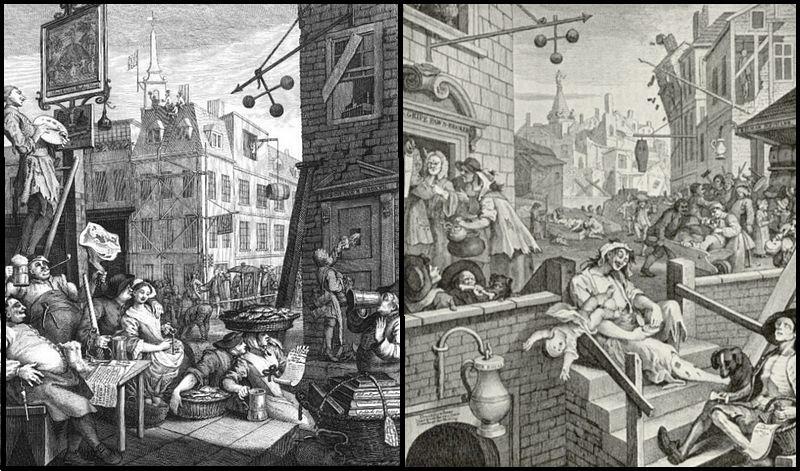 This issue was famously highlighted by William Hogarth in his contrasting prints of 1751 entitled “Beer Street” and “Gin Lane”. These prints were commissioned in support of what would become the Gin Act of 1751 which was enacted in order to reduce the consumption of spirits, a popular pass time that was regarded as one of the primary causes of crime in London. By prohibiting gin distillers from selling to unlicensed merchants and increasing fees charged to merchants, it eliminated small gin shops, thereby restricting the distribution of gin to larger distillers and retailers. Hogarth’s two prints were designed to be viewed alongside each other. They depict the evils of the consumption of gin as a contrast to the merits of drinking beer. 1) Harben, H.A, – A Dictionary of London. (London, 1918).